Going through advertisements, making a list, comparing deals and offers. With the festive season on, the retail pull is strong. The best and simplest way to buy a product is to pay cash. It could even get you a discount, meaning you buy at the lowest cost possible. But if you find your cash stretched, there’s plastic to the rescue. Now, you have the option of paying back in equated monthly instalments (EMIs). But does it make sense to do so? The third option is to opt for “balance transfer" of the outstanding amount and save on interest charges. The fourth option is to convert the entire purchase into EMIs. If used well, this can work in your favour. The facility is similar to a personal loan. The difference is that the rules for personal loans are stringent and there is a documentation process. The EMI route avoids paperwork and the waiting for approvals. Your existing card gets you the loan and you simply start paying the EMIs. Moreover, you know exactly how much you would need to pay each month. If the amount is not huge, it works better than a personal loan. 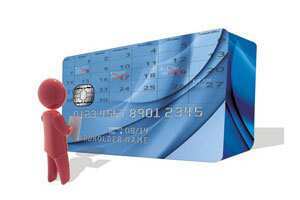 Not all credit card-issuing banks offer separate EMI cards. But most banks do offer the option even on an existing non-EMI card. Check with the bank if your card has this facility. For example, HDFC Bank credit card holders have to call the bank to check if the EMI conversion offer exists on their cards. Certain merchant establishments have a tie-up with HDFC Bank and you can convert purchases from these places into EMIs if you buy using your HDFC Bank credit card. On the other hand, Axis Bank’s Gold Plus card allows you to convert any amount above Rs5,000 into six, 12 or 24 instalments. The pay-back tenure varies across banks and types of cards, as do the minimum transaction amounts that can be converted (see Cost of instalments). Each instalment, or EMI, will be equal to the principal amount of repayment plus the applicable interest amount. In most cases, you have to pay a one-time processing fee. 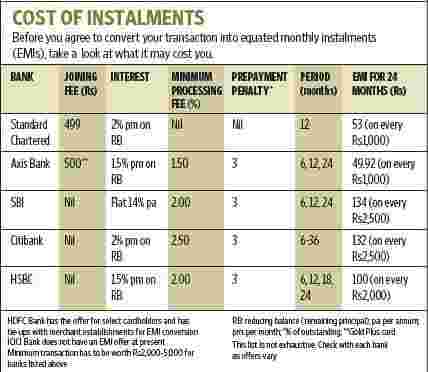 Some banks also offer interest-free EMI schemes (by asking only for the processing fee), while others levy interest in addition to the processing fee. The latter works out cheaper than the roll-over facility in credit cards. For a transaction of, say, Rs5,000 on a credit card, if you roll over the credit and pay only the minimum 5% every month, it would be five years before you can completely clear the dues. However, before you swipe your card and convert the payment into EMIs, it’s important to understand what you are paying and how it works to make sure you don’t end up paying too much. Let’s take an example to see how interest rates on credit cards work. Say the purchase is of Rs1,000 and the EMIs are supposed to be paid for 12 months. The EMI works out to Rs91.68 each month at 1.5% interest on monthly reducing balance. This means 18% (1.5%x12 months) on reducing balance and a flat interest rate of about 10%. So at the end of 12 months, you have paid 10% more than the product’s MRP. Not to forget the additional processing fee that may be levied. In addition, if you wish to prepay the pending amount, there would be prepayment charges. All these charges could make the final cost much higher. However, this amount is likely to be lower than if you had taken a personal loan. These days, banks are quick to call and offer to convert a purchase into EMIs. Paying through EMIs may sound simple, but it could land you into trouble by piling up the debt. It is always better to pay-to-live than live-to-pay. So, before you agree, ask about the processing fee, interest rate, prepayment charge and flexibility in time periods. Do the math and see if the deal is worth it. Also, if you are ready to pay the entire amount on the due date, avoid splitting into EMIs. Apart from looking at the various charges, make sure you understand how the specific scheme works for you. Check the repayment schedule. Ask about penalties and take care to avoid paying any. Above all, keep your spending under strict control. From now, even if you don’t inform your bank about your change of address, it will have your latest contact details. “Locate Plus", a product launched by Credit Information Bureau (India) Ltd (Cibil), will help banks locate customers even if their contact details have changed. Locate Plus will locate you by your name, PAN card number and voter ID. So if you have an overdue on your credit card in Mumbai and you relocate to Delhi and open a bank account in a different bank, the credit card lender will get your contact details through Cibil. A life insurance policy becomes valid on the date of acceptance of the policy or the date of receipt of the first premium in full. Did you know that if the insurer finds that you made any untrue statements or that you did not disclose any material information in the proposal form or personal statement, the policy contract becomes null and void? In such circumstances, insurers have the option of stopping all benefits under the policy. Moreover, premiums paid under the policy can be forfeited. However, to protect the policyholder’s and claimant’s interests, section 45 of the Insurance Act, 1938, provides that insurers can’t exercise this option two years after the commencement of the policy unless the incorrect statement is in respect of a material fact and was made deliberately with an intent to defraud. Now, you don’t need to worry if you don’t have enough margin money to avail a home loan, even when you can afford a higher loan. Thanks to the availability of funds and better economic prospects, banks are reducing margin requirements for home loans. Margin requirement is the percentage of the down payment a customer has to make on a home loan. Once this percentage is reduced, borrowers will be able to get a bigger slice of the total cost of the house as home loan. The initiative has been taken up mostly by public sector banks such as State Bank of India and Punjab National Bank. There has been a 5-10% reduction in margin requirements. If you are planning to buy a new car, don’t dismiss the extended warranty your purchase comes with. Check what it covers. Some cover only the engine and transmission in, maybe, the third and fourth years after the end of the new car warranty. If nothing has gone wrong in years 1 and 2, it is unlikely to stand you up in years 3 or 4. Even if it does, you will be hard put to pin it down as the “manufacturing defect" covered by the extended warranty. So ask for printed terms and conditions and don’t go by word of mouth alone.